Enabling this feature will force only one profile to be active at any time. If other devices are subsequently setup with the same profile (DeviceID), the server will prevent those specific devices from connecting, i.e. they will not be able to send any punches to the system and will receive a message notifying the user of this fact. 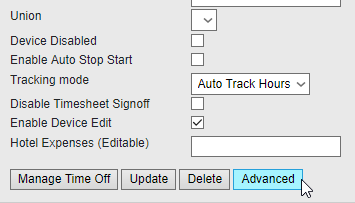 By doing that, you will enable a message identification using a Unique Field Identifier on each message. The device that is currently synchronized with its own identifier will be the one considered as "Active" and any other messages received from the same device ID but with a different identifier (as would happen when setting up the app on other devices) will be discarded. There will come the time when you need to setup the app on a new device (e.g. if the old phone is damaged and the user needs to upgrade to a new phone), so here is where resetting the unique identifier comes into play. By doing this, you will leave the identifier open so that the next device that you setup can get its own ID and start sending and receiving data to the server. 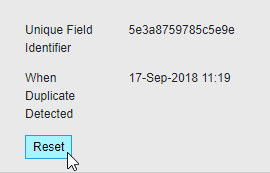 On the next screen you will see the Unique Field Identifier that is currently assigned and if available, the last date when a duplicate device was detected. Click on the "Reset" button and that should open up the profile for a new device to be setup.